Power. As the common wisdom goes, “Power Corrupts. Absolute Power Corrupts Absolutely.” And Krueger is absolutely corrupt – to a monstrous degree. Because Krueger despises shifters. And to carry out his vendetta against shifters, he works himself into a position of power – the power to own and control their very lives. And when he loses his temper? Well. The Breckenridge Crew of bear shifters are suffering under Krueger’s thumb, forced to fight, kill, and flat-out murder at his beck and call. And into this mess Rory and her son, Aaron stumble, desperate for help from Aaron’s father – the father who doesn’t know Aaron exists. Well you can’t blame Rory. A one night stand is all there was, and though Rory didn’t intend it, Aaron is the best thing that has ever happened in her life. But when Aaron shifts into a bear just before his first birthday, her terror that someone will hurt or kill him for being ‘different’ leads her to cancel her planned trip back to Breckenridge to introduce her son to his father. But now, at age five, Aaron’s bear has become completely uncontrollable. Uncontrollable, and dangerous. He has already hurt Rory, badly. And in order to protect him, she must find help. Even if it means trusting that the man who donated the sperm to his creation is first, safe for Aaron, and second, is, or knows about, bear shifters. Is Aaron a huge jump in human evolution? Or do other shifters exist? And is Cody Keller one of those? 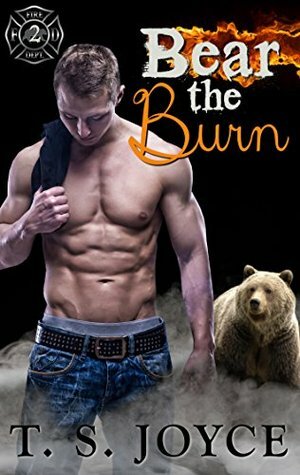 This is a good UF/Bear Shifter Romance story. But what makes it more than just another shifter story is how well Joyce handles the issue of Krueger and the International Exchange of Supernatural Affairs. The misuse of power, visceral hatred of shifters who only want to be left alone, and the political manipulation of a government agency for personal hate mongering and power brokerage is handled beautifully. The ending solved one problem, but in such a way that I know the problem will continue in Bear the Burn (Fire Bears Book 2). I picked this book up after spending several hours in the garden, showering and then having a bite to eat. I picked it up as something “easy” with a HEA. What I got was better than I expected.